What's a young guy who ran a pizzeria in Buenos Aires doing thousands of miles from home? He's still cooking, not pizza, but Argentine grilled meats in Baja California wine country. Angel Eduardo Garralda left Argentina seven years ago with his brother. Their first venture was a pizzeria in Ensenada. When the brother went home, Garralda moved on to his dream, grilling meats just like at home. He's found the perfect place for a parrilla restaurant, a winery ranch that is as much like gaucho country as you can get outside the Pampas. Each weekend, he grills away in a rustic open-air structure at La Casa Vieja winery. Visitors may be surprised to hear tango as they sample the wines. This is a clue that Garralda is on the premises. The two enterprises complement each other perfectly. La Casa Vieja is one of the oldest properties in the Guadalupe Valley. Its grape vines are so old that no one knows when they were planted. The wines are historic, individualistic and just right to drink outdoors, with Garralda's food. There's a red produced from Mission grapes, which may be a cross between European and indigenous grapes, says winemaker Thomas Toscano. Still in barrels, it will be released in April, 2010. And there's a fragrant, dry, unfiltered Palomino, a white wine made in such small quantity that the latest batch is almost sold out. To show how casual this place is, the label is a handwritten strip of masking tape. La Casa Vieja means the old house. And that's what it is, an adobe house from the 1800s restored by Colleen and Humberto Toscano, Thomas Toscano's parents. 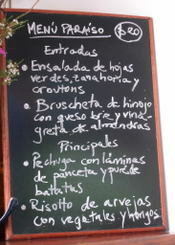 Sitting on the terrace, one looks out on olive trees and Las Brasas, the parrilla restaurant. Garralda cooks steaks, ribs, Argentine style chorizo and other meats, brushing them with his own chimichurri, which he has bottled and sells. But he hasn't forgotten pizza. La Casa Vieja is constructing an outdoor adobe oven. When that's ready, Garralda will probably be the only pizza chef in Baja who sips mate while he works. Las Brasas is at La Casa Vieja Winery, Km 93.5 on Highway 3, the Ensenada-Tecate highway, near the town of San Antonio de Las Minas. Tel: (646) 113 6783. The restaurant is open Friday, Saturday and Sunday from 11 a.m. to sundown. La Casa Vieja Winery has a wine bar, sandwiches, cheeses and other food to accompany tasting, a shop selling local arts and crafts, homemade jams and jellies, olive oil and other products. Tel: (646) 155-3153. For more information, go to www.lacasavieja.baja.com. Who would guess that my top dish in Buenos Aires this past trip would be—not steak, not pizza, not pasta, but a Chinese stir-fry. It was a beautiful contrast to the overload of ham and cheese in which I had indulged. Apart from steak, these two seem to be the staff of life in Buenos Aires. And I was ready for something else. I found it when, by accident, I wound up in Chinatown. I had gone to Belgrano to visit the Museo de Arte Espanol Enrique Larreta, a mansion that is now a museum of Spanish art and furnishings. But I arrived too early. it hadn't opened. There was nothing to do but explore the neighborhood. Walking along Avenida Juramento, where the taxi had let me off, I passed the usual cafes and shops. And then I stumbled upon Arribenos, a cross street crammed with Chinese restaurants, markets and shops selling the sort of Asian trinkets you find in Chinatowns everywhere. The Casa China had the same things as Asian markets in Los Angeles, from woks and ladles to sushi vinegar, low-salt soy sauce, lemongrass, Thai shrimp paste and fresh seafood on ice. But where to eat? There were too many choices. Midday bargain lunches were tempting. For as little as $4.50, they offered several options. But which would be best? And that is how I came to eat at Todos Contentos, a traditional Chinese restaurant fitted out with red lanterns, red walls and placemats with Chinese horoscopes. Instead of chopsticks, tables were set with knives, forks and big spoons. My $7.60 choice from the "menu con platos combinados" (combination plates) included just two dishes and a drink. All three were very, very good. Pollo con almendras (almond chicken) was light, fresh and perfectly cooked. The moist and tender chicken chunks were tossed with diced carrot and red and green bell peppers, then finished off with a handful of fried whole almonds. The chop suey beside it showed off impeccably fresh, crunchy bean sprouts combined with shredded carrot, green onions and cabbage. The sauce for these dishes appeared to be nothing more than broth seasoned lightly with soy sauce. And so I was able to taste the food directly, free of extraneous flavors. The drink choices were mineral water, a gaseosa (soda) or cold tea. Even the tea was exceptional, at least to my taste. It came in a tall glass without ice but sweetened, just as tea in Indonesia is sweet unless you specify no sugar. Todos Contentos means everybody content. After that lunch, I was no exception. Todos Contentos, Arribenos 2177, Belgrano, Buenos Aires, Argentina. Local Tel: 4780-3437. The first place I ate a milanesa sandwich was in Buenos Aires at the Pasadena Cafe. This was my first meal in that far off city, late at night after the long flight from Los Angeles. It seemed odd to find, across the street from my hotel, a cafe with the same name as the city adjacent to my hometown. Even odder, the next time I had a milanesa sandwich was in Pasadena itself, and at an Argentinian restaurant. Malbec (in the bottom photo), which replaces a short-lived Argentinian place on Green Street, offers "new Argentinian cuisine," but also old favorites such as empanadas, gnocchi, sorrentinos (Argentinian ravioli) grilled meats and milanesa sandwiches. Malbec's milanesa is a thin cut of beef or chicken that is breaded, fried, then layered with arugula and tomato in a baguette spread with mayonnaise and grainy mustard. In comparison, the Pasadena Cafe's milanesa was rudimentary--a thin, chewy strip of fried meat gripped in the center by a tiny roll. A glass of house red wine and dulce de leche gelato decorated with wafer cookies completed that meal. At Malbec, lunch started with a basket of baguette slices to eat with chimichurri, a classic Argentinian sauce made at this restaurant with parlsey and fresh oregano, olive oil, lemon juice, pepper and other spices. Next came the day's soup, a simple but very good puree of broccoli, leeks and potato. The French fries with my sandwich were commercial. Nevertheless, they were the best that I have had recently--soft, hot potato inside a thin, crisp outer layer. Light, and not greasy. I ate every one. Instead of the Pasadena Cafe's nondescript glass of borgona (Burgundy), I sipped with great pleasure a glass of Don David reserve Torrontes from Salta province in northwestern Argentina. This light, floral white wine is perfect for lunch. In a restaurant named for Argentina's premier red wine grape, there is bound to be a good selection of Malbecs. The wine list, composed exclusively of wines from Argentina, offers 17 of them. On a previous visit, I ordered Finca de Domingo Malbec from Salta, interesting because most Malbecs come from Mendoza, the main wine-making region of Argentina. However, Salta produces some that are excellent. That time, I ordered a dish that Argentinians love to hate, gnocchi, which is traditionally eaten on the 29th of the month, when money from the last paycheck is running out. The only time I ate gnocchi in Buenos Aires, the dumplings were tough and chewy, which would justify the porvery link. However, I was eating them in fashionable Recoleta, and they were not cheap. Malbec's gnocchi restored my confidence. The dumplings were light and tender and the tomato-laden beef stew that went with them was a great dish in its own right. Sometimes eating food far from its place of origin means making do with second-rate renditions. That is not true at Malbec, based on what I have had. And the prices are reasonable. An $11.95 business lunch special includes soup or salad, any sandwich or a pasta, coffee or a soft drink. Wine is additional. 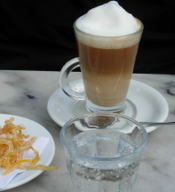 Pasadena Cafe, Guido 1705, corner Rodgriguez Pena, Buenos Aires, Argentina. Tel: 4815-0545. Malbec, 1001 E. Green Street, Pasadena, CA 91106. Tel: (626) 683-0550. The empanadas are good at La Americana. They ought to be, because this big, bustling restaurant in Buenos Aires claims to be "La Reina de las Empanadas " (The Queen of Empanadas). What I go there f or isn't the empanadas, though. but the penguins. No, not penguins to eat, but to provide more wine than I should probably drink at one sitting. 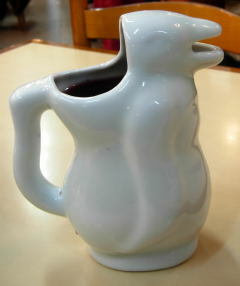 For some reason that I don't know, ceramic penguins are prized as wine decanters in Buenos Aires. Not just at restaurants but in homes too, because housewares stores sell them. They come in various sizes, either white or brown. White is the usual color for wine. Brown might do for beer. Not knowing about the penguins, I went to La Americana because Jose, a guy I met at a pizza place, sent me. He thought I would like the empanadas. "They might be too spicy for you," he warned. They were not. "Spicy" in Buenos Aires means an extra shot of "spices" such as green onions, not chiles. So an empanada saltena con picante, a Salta style beef empanada at La Americana, contained nothing very picante. Hojaldra de atun--tuna inside puff pastry--was sweet and caramelized at the edges. And pascualina wasn't an empanada at all, but a wedge of spinach and egg torte. This was hearty food, and I needed liquid refreshment. A penguin of house wine to the rescue. A few days later I went back for an empanada criolla (hand-cut beef) and a pizzeta calabresa, a little pizza topped with tomato, mozzarella, sausage and a sprinkle of oregano . This time, I chose Crotta Bonarda Malbec from the wine list. It too came in a penguin. A few months later, I was back. This time I consumed an entire pizza Brasilena (tomato sauce, mozzarella, ham, pineapple, red bell pepper and green olives). It was late, and the restaurant was jammed. But the line for tables moved quickly, and I was soon wedged in a corner seat by a window where I could observe penguins as they arrived at nearby tables. Prices have risen in Buenos Aires. Nevertheless, this May, my pizza cost less than $7, and would easily have fed two, maybe even three. And the medium penguin of house red wine that you see in the photograph cost just one peso more than the year before--a birdful of wine for only $2. La Americana, 83 Callao, corner Bartolome Mitre, Buenos Aires, Argentina. Tel: 4371-0202. The spicy Korean stew kimchi jjigae is as simple as it is wonderful. My Korean friend Sejun g can whip it up in seconds, using cabbage kimchi, pork, onion, garlic, tofu and rice cakes. Aside from hers, the best kimchi jjigae that I have eaten recently was at a restaurant, not in Koreatown, Los Angeles, where there are scores of eating places, but in Buenos Aires. No tourist would ever find Kil Chong. It is hidden away in Flores, a section of the city where the first Korean immigrants settled in the 1960s. There is no sign that says restaurant, no indication of cooking, no dining room that can be seen from the outside, just the name in the Korean script Hangul on a small lantern high above the doorway. I found it thanks to two friends, Korea-born Monica Lee and Carolina Mera, a professor at the University of Buenos Aires who lectures and writes about Korean migration. Driving around the barrio with them, I saw Korean-owned textile businesses, a Korean school, churches, a Buddhist temple, a panaderia (bakery) with a sign in Hangul, small markets and other enterprises. The Korean population of Argentina once numbered 45,000, Carolina said. Now it is down to 20,000, almost all of them in Buenos Aires. Long ago, Flores was a wealthy area and a separate town. The rich moved elsewhere and Flores was amalgamated into the city. During Argentina’s economic crisis from 1991 to 2002, many of its Korean inhabitants left the country, and the barrio became impoverished. On Saturday, when businesses close in the afternoon, it was especially quiet. Fortunately, Kil Chong was open. We entered through a bare hallway, then climbed upstairs to a plain room with formica-topped tables and ceiling fans. The restaurant caters to Koreans, not outsiders, and so the menu is in Hangul, with no Spanish translation and, certainly, no English. There are just 16 dishes, including bulgogi (grilled beef), galbi tang (short rib soup), mandu (dumpling) soup, bibim bap (a rice bowl with meat, vegetables and egg), sun dubu (soft tofu), naengmyeon (cold noodles with or without broth), and kimchi jjigae. Our lunch was impressive. We feasted on 10 side dishes (banchan) in addition to the dishes we ordered, a far more generous display than that offered at a couple of ambitious new Korean restaurants in Los Angeles. Along with sweet and sour radish, cucumber strips, soy bean sprouts and other vegetables, the little dishes held dried radish leaves, squares of Korean pancake, dried fish with potato, tiny spicy dried fish and fatty pork slices with hot red sauce. 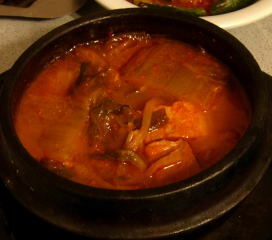 Fiery red, richly flavored kimchi jjigae came in a black stone bowl. The marinade for b ulgogi (grilled beef, cooked in the kitchen), was topnotch. Carolina asked for yukgae jang, a spicy meat soup, and Monica wanted naengmyon drenched with sweet and spicy red sauce. Kil Chong makes its own kochujang, the red pepper paste that is used in many Korean dishes, and this indicates the effort that goes into the food. Tourists are more likely to go to Bi Won, which is closer to the heart of town and well publicized. 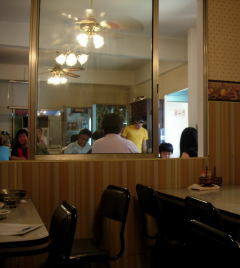 Although owned by Koreans, Bi Won cooks for Argentinian tastes, and the food lacks true Korean flavor. 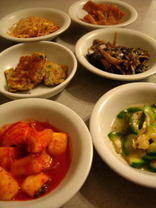 The night I was there, the restaurant had no kimchi, which would never happen in a genuine Korean restaurant. Bi Won offers the sort of Asian decor that tourists like, and the service is good. But for food, Kil Chong is worth the long ride to Flores, a barrio way off the tourist trap. 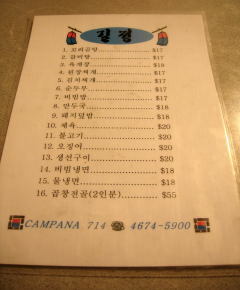 Ordering from a menu in Hangul needn’t be a problem. Just point to numbers 5, 7, 8 and 11, and you will have a delicious, inexpensive meal of dumpling soup, grilled beef, bibim bap, kimchi jjigae, beef broth, rice and all the banchan you can eat. Kil Chong, Campana 714, Flores, Buenos Aires, Argentina. Tel: 4674-5900. 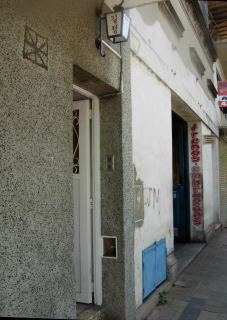 Bi Won, Junin 548, Buenos Aires, Argentina. Tel: 4372-1146. Fuller reviews of most of these restaurants will appear on www.tableconversation.com in the next few weeks. One thing is certain. Both cities offer plenty of good eating. Best Restaurant: Pescados Capitales, a seafood restaurant in Miraflores. Best Main Dishes: Pork loin glazed with algarrobina (carob) sauce and Trujillo style arroz con pollo (chicken with rice) at El Senorio de Sulco in Miraflores. 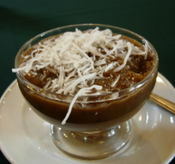 Best Dessert: A tie between cherimoya mousse on a crunchy praline crust at Pescados Capitales and coconut-topped arroz zambito, an exceptionally good version of a traditional rice pudding, at El Bolivariano in Pueblo Libre. Best Coffee: Peet's coffee at my guest house in Miraflores. Toughest Ticket: Getting into La Mar, the trendy restaurant on Avenida La Mar in Miraflores. Best Food Buy: The normous caramelized pecans from Ica at a dried fruit and nut stall in the San Isidro Municipal Market. Best Non-Food Buy: Salad forks and spoons made of beautifully grained olive wood from Arequipa. Nicest Surprise: Stumbling across a copy of the out-of-print book “Los Chifas en El Peru” (a history of Chinese restaurants in Peru) by Lima journalist Mariela Balbi. Nicest Moment: Snagging a table at La Gloria in Miraflores, ranked as one of Lima’s top restaurants, on my last night there without a reservation. Greatest Disappointment: Gloomy, sodden weather. Next Trip: Another try at La Mar and a side trip to Arequipa, renowned for its cuisine. 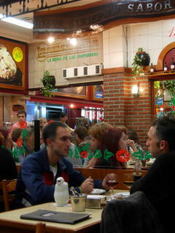 Best Restaurants: Almanza in Palermo Viejo and Social Paraiso in Palermo Soho. Best Main Dish: Bondiola (pork shoulder) at Almanza, tender enough to eat with a spoon. Best Dessert: A tie between burrata with fresh and preserved fruits, strips of local cheese, aged balsamic vinegar and black pepper at Damblee in Balvanera and crisp, sweet dried apple slices layered with passion fruit mousse and accompanied by a scoop of Sichuan pepper ice cream at Social Paraiso. Best Drink: Domingo Molina Malbec 2003 from Salta. Best Coffee: Café cortado (coffee layered with hot milk) accompanied by candied orange peel shreds at Croque Madame, the restaurant at the National Museum of Decorative Art in Barrio Norte. The museum was once the mansion of the elite Errazuriz Alvear family, which makes the setting as alluring as the drink. Toughest Ticket: Getting into tourist magnet La Cabrera in Palermo Viejo at night without a reservation. The wait can last an hour. Best Food Buy: A luscious glazed nut tart at Las Familias bakery near Social Paraiso. Best Non-Food Buy: A pizza slicer made in Argentina. Nicest Surprise: Finding really good Korean food in a distant part of Buenos Aires. 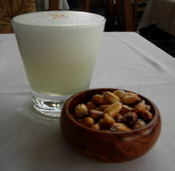 Nicest moment: Sipping a glass of fragrant Torrontes in the late afternoon at Cartoon Bar and Restaurant in Recoleta. Greatest Disappointment: Tough, fatty grilled matambrito (a thin cut of pork) at El Trapiche in Palermo Viejo although the restaurant is known for this dish. Next Trip: Back to old favorites such as El Yugo in Recoleta and Il Vero Arturito in Abasto. And I’ll bring home a sack of medialunas, the delicious crescent rolls that Portenos adore. July is independence month in South America. Venezuela celebrates July 5, Argentina, July 9 and Peru, July 28. Along with parades, flag-waving and speeches, the celebrations play up traditional foods. In Argentina, where I’ve taken part in independence festivities, restaurants promote indigenous dishes such as locro (a corn stew), empanadas, humitas (akin to tamales) and carbonada, an extraordinary sweet-sour combination of beef, vegetables and fruits. My favorite place to eat carbonada is La Querencia in Buenos Aires. One taste, and I was so enchanted that I hunted down a shop selling the rustic brown pottery bowls in which this stew is traditionally served. Back home, I went to work recreating it, with great success. Beef stew sounds like a hearty winter dish. In Argentina, July is winter (the seasons are opposite from those in the northern hemisphere), but carbonada is so light that it wouldn’t be out of place on a July menu in the United States. That’s because fruits and vegetables dominate the meat, which is cut into small pieces, not hearty chunks. The sweetness comes from peaches (La Querencia uses canned peaches; I use dried), raisins and a dash of sugar. These may sound like odd components for a stew, but the combination is delicious. Carrots and yams add sweetness too. The other vegetables, all New World natives, are tomatoes, corn and potatoes. Some versions add yellow squash as well. 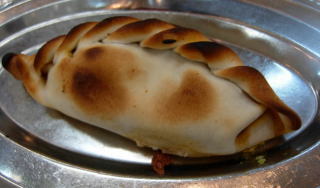 Carbonada is also popular in Peru, which is not surprising, because Lima was Spain’s seat of power in South America, and the stew is most likely a new world interpretation of a Spanish dish. The rustic food of northwestern Argentina, where Inca influence was once strong, dominates La Querencia’s menu. The restaurant goes all out for independence day, decorating lavishly with the blue and white Argentine flag. Traditional dishes such as empanadas, locro, carbonada, pastel de papas (an Argentine version of shepherd’s pie) and humita en chala, a grated corn mixture wrapped in a fresh corn husk, are on the menu all year, not just during patriotic holidays. I’ve eaten carbonada elsewhere, but in my opinion, that at La Querencia is the best. La Querencia, corner Junin and Juncal, Recoleta, Buenos Aires. Tel: 4821-1888. The day before, place the peach halves in a medium bowl and cover generously with water. Let stand overnight. The next day, drain the peaches, reserving the water, and cut in 1/3-inch wide strips. Set aside. Heat the oil in a Dutch oven. Add the beef and cook until browned and any liquid cooks away, about 10 minutes. Push to one side. Add the onion and cook until softened, then add the tomatoes and cook 5 minutes, until tender. Add the beef broth, peach soaking liquid, sugar, 1 ½ teaspoons salt and the bay leaves. Bring to a boil, reduce heat, cover and simmer 40 minutes. Meanwhile, peel the yams and red potatoes. Cut each in quarters lengthwise, then crosswise in ½-inch pieces. Peel the carrots and cut crosswise in ½-inch slices. Place the potatoes and carrots in cold water to cover until ready to use. After 40 minutes, add to the beef the drained yams, potatoes and carrots, the corn kernels, raisins and 2 cups water. Bring to a boil, reduce heat, cover and simmer 45 minutes. Do not allow the liquid to boil away. Taste the broth, and add more salt as needed. Serve in heated bowls. Top each serving with 2 chive strands. The challenge was major--a last meal before leaving Buenos Aires. How could I choose a place so special that I would depart happy and satisfied? Not a problem. 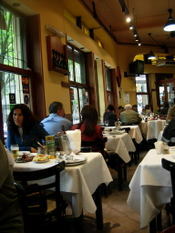 My friend Dan Perlman reviews restaurants (see Another Dinner at Dan's). And he made the decision. “Some of the best food in the city,” he said, as we headed toward Almanza in Palermo Viejo. At lunch, the restaurant offers a three-course fixed price menu that must be one of the town’s great bargains. It’s not a case of three inexpensive dishes drummed up for a low-priced lunch. For 35 pesos, about $12, you can choose a first course, main dish and dessert from the regular menu. The food is interesting, artistically presented, and far outshone my last 5-star meal in Los Angeles (I won’t say where that was). Owner Martin Baquero sent out an appetizer plate of rabbit liver pate with an orange reduction as we debated what to order. I started with a beautiful plate of warm camembert set off by a swirl of herbed walnut oil, tomato confit and a stack of greens. Dan had nettle soup, which was creamy and pleasant. When he suggested pate canard confitado—duck confit—I hesitated, because my last go-round with duck in Los Angeles had been unpleasantly greasy. Dan was right, though. This duck was another story. Marinated, then cooked slowly in duck fat, it was light, tender, moist and not a bit fatty. Mashed potatoes with thyme and onion marmalade set it off nicely. Meanwhile, he ate fusilli with tiny albondigas of beef, porcini mushrooms and nut pesto. The desserts were beautiful. I liked the chunky almond ice cream that came with kadaif, a roll of Middle Eastern shredded pastry on a plate splashed with multi-colored sauces, but I coveted the tarragon ice cream that went with Dan’s apple tart. A Bodega del Fin del Mundo Pinot Noir 2005 was a nice change from the fruit-laden Malbecs that we had been drinking. But I can’t say that airline food was a nice change after having eaten so well at Almanza. I couldn’t believe my good luck. A friend invited me to lunch at Sucre, which is on every list of top places to eat in Buenos Aires. Critics praise it as cutting edge, prestigious, super trendy. Could it be that good? Judging by my lunch, it is. By chance, I ordered what may be the best dish there—bondiola. Never heard of it? Neither had I, so I had to ask. In Argentina bondiola is pork shoulder, and Sucre’s bondiola de cerdo braseada was the finest pork I have had in a restaurant. The meat was amazingly tender, light and slightly smoky. Although the menu indicated it was braised, the pork had tantalizingly crusty brown edges, and I wondered if it had spent some time on the grill. That would explain the smokiness too. Golden slices of batata (sweet potato) and a salsa verde composed of parsley, celery and rosemary added color to the plate. The other dishes that day were fine too—grilled goat cheese provoleta and tiny croquettes of raw ham and manchego cheese for appetizers, along with salmon ceviche that was more delicate than the highly seasoned, acidic ceviches I had been eating in Lima. Perhaps that reflects local taste. My companions were happy with their shrimp risotto and salmon. And the desserts were good looking. Pale cocoa foam coated mine, a composition of dulce de leche cream, banana biscuits and pecans. Coconut cheesecake came with mango ice cream and cilantro oil. The prettiest of the three was lemon-ginger mousse in a bowl of melon and tequila soup with nectarine slices and blueberries. Sucre’s wine list is so long, you could devote the whole lunch hour or evening to making a choice. Because we had to match a variety of dishes, we picked Mounier Torrontes 2005, an aromatic white wine from Finca las Nubes, a winery near Cafayate in Salta province. Sucre is stark and industrial, but not austere. The design elements are interesting. The open kitchen stretches dramatically across the restaurant, and a wall of bottles behind the bar extends as high as one can see. The food stands out against the dark, subtle colors. Perhaps that was what the designers intended. Sucre, Sucre 676 (the restaurant and street names are the same), Belgrano, Buenos Aires. Tel: 4782-9082. One night in Buenos Aires, I went with a friend to San Telmo for a tango concert, arriving so early that the manager of the hall sent us out to eat. Following his suggestion, we walked down the street to Bar Britanico. This decades old café is a neighborhood landmark, old fashioned and cozy. There aren’t many places where a $2 pizza would be set on a sparkling white tablecloth. l talked for days about that pizza It was so simple, so delicious, so absolutely perfect--nothing but mozzarella melted over a thin layer of red sauce on a medium thick, nicely browned crust. The top was sprinkled with finely crushed oregano and decorated with green olives, nothing more. I wasn’t hungry, but I ate the whole thing. I was lucky to get that pizza, because a year ago, Bar Britanico closed, causing a tremendous uproar among neighbors and regulars. The owners, miffed at having to pay more rent, departed with their olives, breads, hams and venerable cash register. Eventually something was worked out, and Bar Britanico reopened, under new ownership I guess. As a newcomer, I couldn’t tell how it had changed, or if it had changed at all. But I’m glad to know that it survived. Great old places deserve respect--especially if they can turn out such good pizza. Bar Britanico, Avenida Brasil 399, San Telmo, Buenos Aires. Tel: 4300-6894.